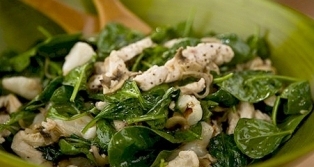 This yummy chicken salad with kefir is a perfect meal for the whole family to enjoy! In the pan, heat up chicken with onion and seasonings. Add the tomatoes, kefir and cheese and cook a couple minutes. Place the salad on a serving plate then chicken mixture on top. Add salsa if you want.